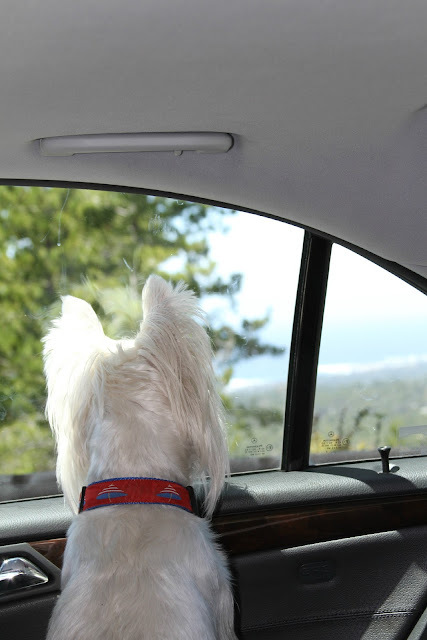 After we wrote our blog post yesterday, we cruised around checking out some other dog blogs. You know, checking out the competition and all. 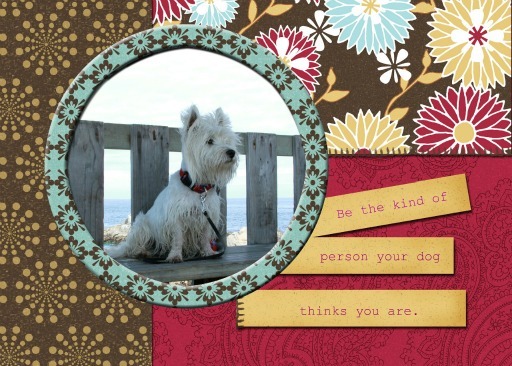 We happened upon this really cool site called The Pet Postcard Project. You dog lovers should really check it out. The way it works is, you create a pet themed post card giving advice or expressing a wish and for every postcard received, depending on the campaign running at the time, a certain amount of food is donated to a particular shelter. The card up there is one of the ones we did. And for those of you thinking you aren't creative enough or don't have the time, check out picnik.com. It's what we used to create our postcard up there. Easy, breezy, even when you're using paws on the keyboard, puppers. Ok, you Brits ... this one is for you. I don't know how exactly we got on to this topic today, but here's a few things Union Jack that we thought you might enjoy. 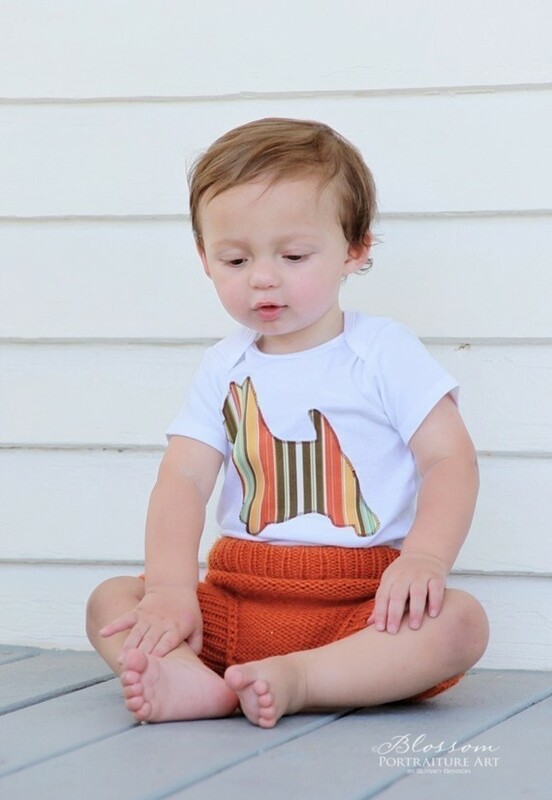 THE LEASH can be found at Nola and Spencer on etsy right here. THE RETRACTABLE LEASH can be found at Reese's Room right here. The T-SHIRT comes in black or red and you can order it here. Dang, dang, dangity dang, dang. 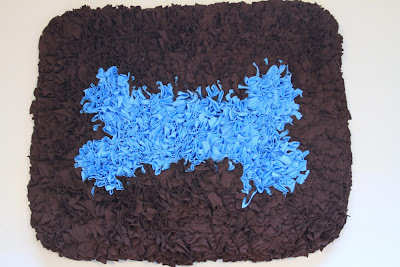 We love this pillow, and now we can't figure out where we found it. If it's you or you recognize it, please let us know and we'll give you full credit for your image and send our folks your way! 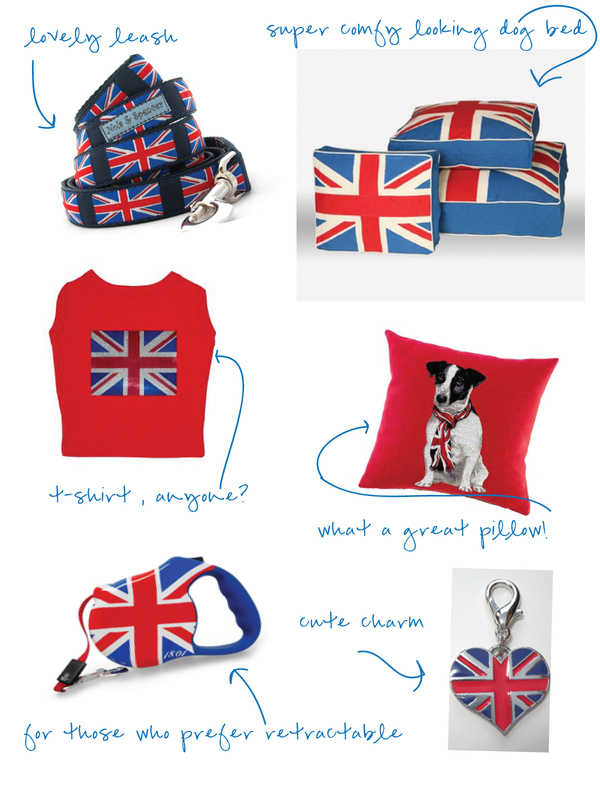 The great Union Jack DOGBED can be found right here at Rockstar Puppy. The COLLAR CHARM by Diva Dog (and modeled by my handsome self above) can be found here. We found all this and more. Maybe next week, we'll go Italian! Well, carrying on in the weekend tradition of it's all about me, check out my new collar up there. You know, by now, that I am quite the collar changer. Check out this fancy neckwear my girl Sophie sent me. 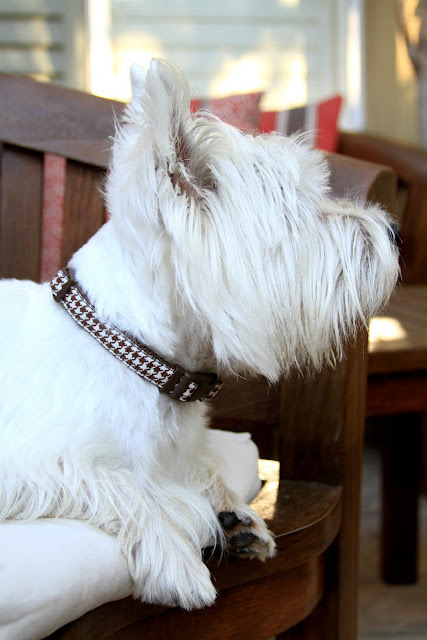 It's hard to find a collar manly enough for a stud such as myself, but she did it. You can get yourself one here if you don't have a traveling fan club bringing you one. A weekend all about moi???? A great group of friends came all the way from TEXAS to hang with me this weekend. Yep, pretty sure they were here for me, and me only. Never mind all the surfing and shopping and dining and celebrities they talked about. Never mind all the time mom spent away from home with them. Pretty sure I was pretty much all the celebrity they needed this weekend. The party always ended at my house, doggers. Yep, all the celebrity anybody can handle right here at our house. Bo Obama ain't got nothing on me. Seriously, has Shannon ever gone to DC to visit him??? She came all the way from Texas to hang with moi. Yep, got a new BFF, and an amazing one at that. Call me lucky puppers, call me lucky! You know how sometimes you just really, really need the right pillow to get exactly perfectly comfortable??? You know how Mom sometimes like to channel her "inner Martha?" Well. We got on this pillow kick around here recently. Yep. We were gonna sew some dog themed pillows. Mom got in her Mighty-Martha Mode and got out the sewing machine and everything. There's a first time for everything, right??? But, smart dog that I am, I kind of was thinking I knew how this might turn out so I hopped onto the internet and did my own kind of pillow research. 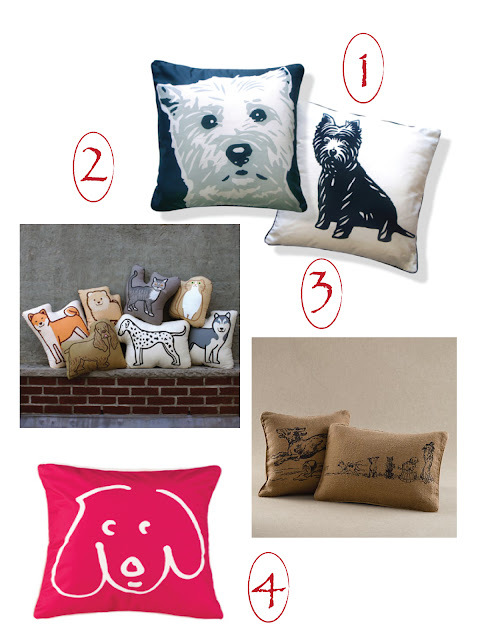 Number four: Crypton makes some stain, moisture and odor resistant (thus so very much to my liking) great looking dog theme pillows ... find them at www.cryptonfabric.com. The one shown is the "doodle dog" pillow. 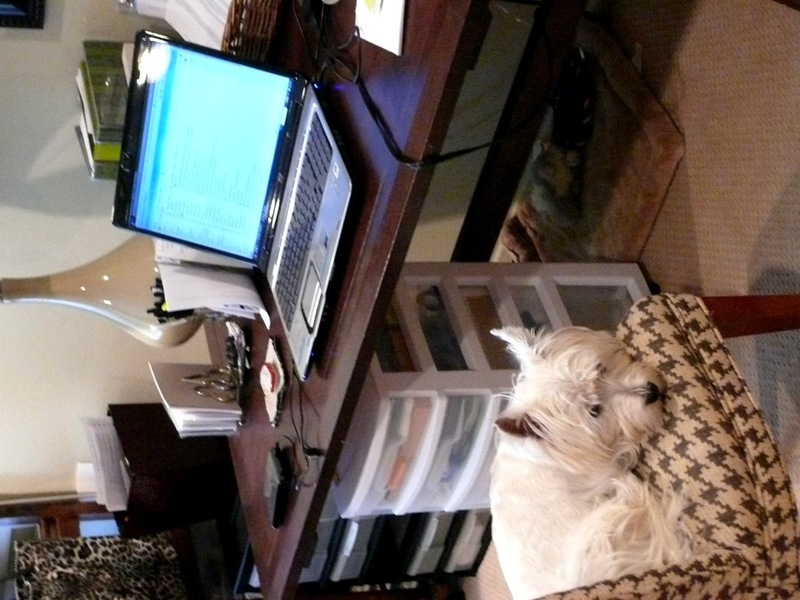 Here's hoping today's blog made you perfectly comfortable, puppers! 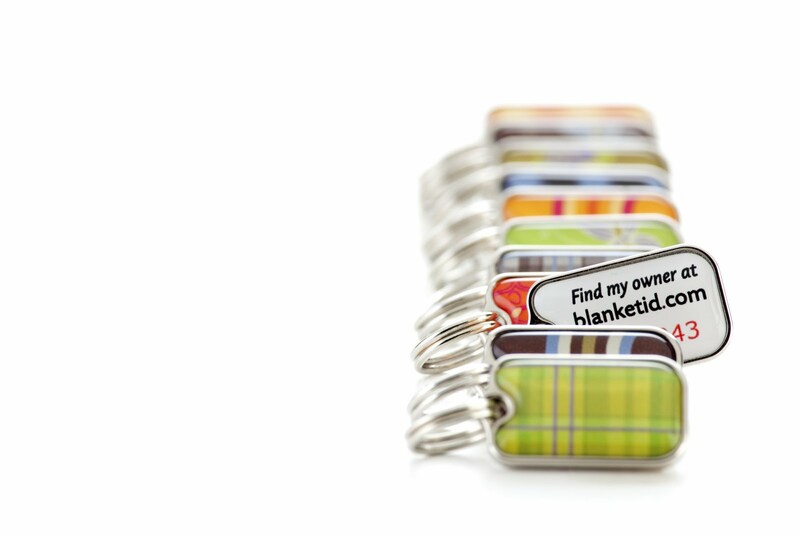 Well, we have to admit, as proud as we were of our tags yesterday, we don't even come close to these cool PET ID tags from blanketID. Seriously good design. Seriously good concept. Check it out here. Should your dog pull a fast one (who moi?) and get lost, report him to blanketID and they'll alert the SPCA, animal hospitals, shelters and other nearby blanketID members to be on the lookout. Everybody has full access to your pet's info and picture. When your pet is found, the finder enters the blanketID tag number on the website and, WOOF, you and your pup are reconnected. And, as if that wasn't enough, more than 15% of the company's profits go into a fund to help animals in need. Sylishly safe, just the way we like it around here. Sorry you didn't hear from us yesterday ... we were crafting. Yes, that's right, CRAFTING!!!!! Step One: Remove dog from workspace. Not sure why this picture will only load sideways, but you get the point!!! Order your Shrinky Dinks here. "Shrinky Dinks" are printable plastic sheets that you print on with your inkjet printer and then stick in the oven to create a whole host of small plastic goodies. 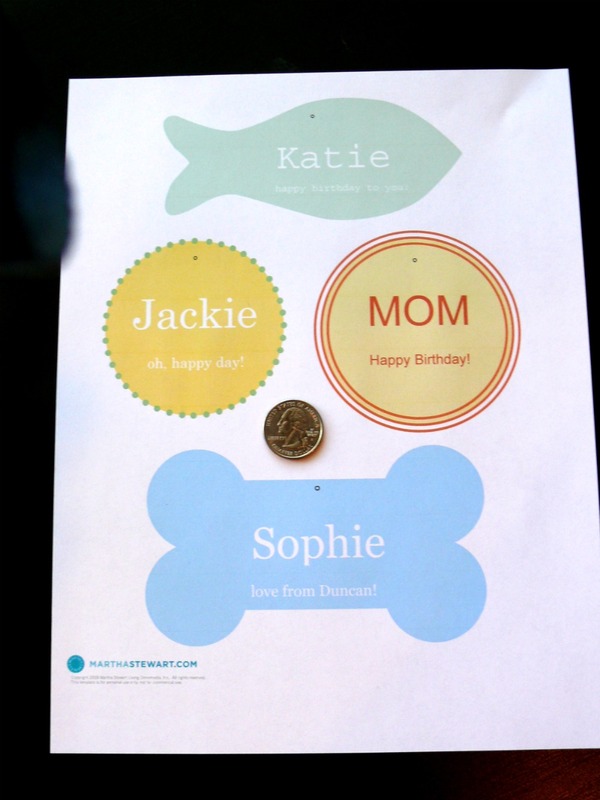 Since we got the idea from Martha Stewart, we went with her Pet ID Tag concept and printed her template, which we got here. Input whatever data you want to onto the template and print it out on a Shrinky Dink sheet. 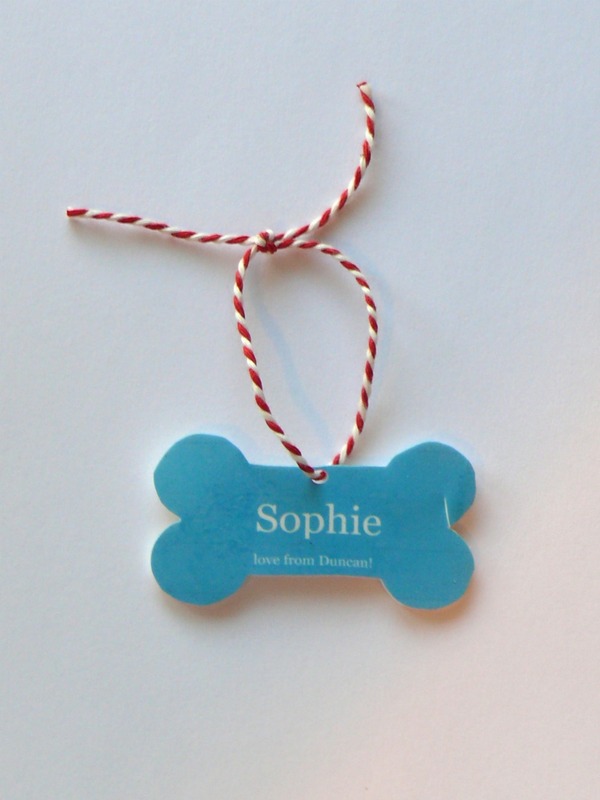 We changed things up a bit from the original idea, and created pet gift bag tags and pet lover gift tags. The designs start out really big. Oh, and pardon the crinkles in the paper there. My bad. 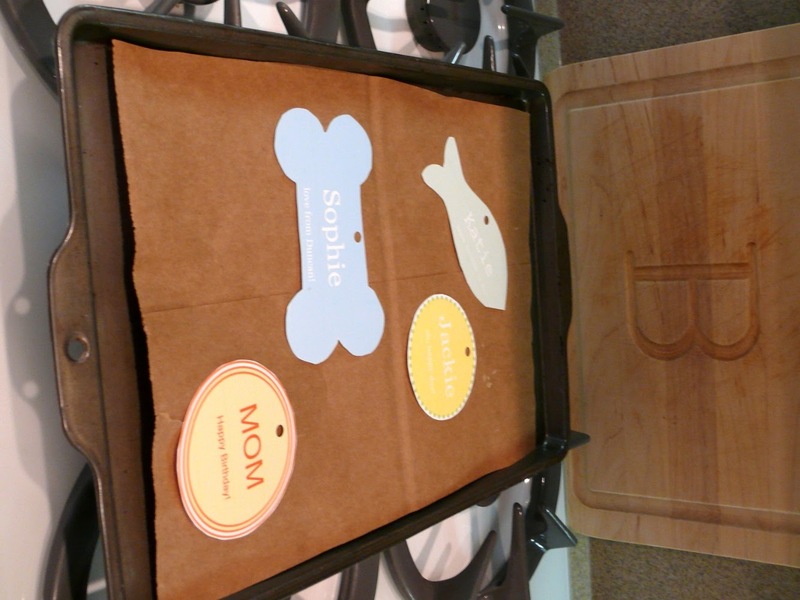 Preheat the oven to 275 - 300 degrees and cut out your designs and put them on a cookie sheet with brown paper underneath. Don't forget to punch a hole in your cut outs -- you'll need a bigger one than you think as the hole shrinks too. We used a regular hole punch and it worked out perfectly. A few notes about this (learning lessons, as we like to say around here): The tags will come out exactly as you cut them ... if you have a rough edge when you cut out your design, your finished Pet ID tag will have one too. And, the paper is a bit rigid. We got a crack in our blue tag when we cut it, and it did not "heal" when we shrank it. 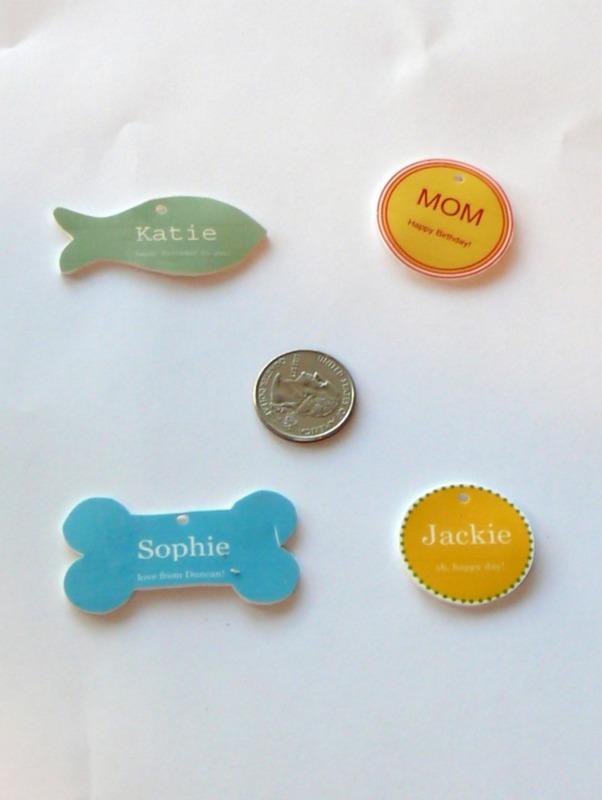 Bake your Pet ID tags, pet gift tags or whatever pet goodies you've decided to create for about 3 to 5 minutes in the oven. A few more notes here: They crinkle when they start heating up. Kind of freaked us out! We thought this was gonna be a bust but flattened ours by pressing gently with a pot holder during the cooking. As they continued to heat, they flattened out again. Whew. They really do shrink alot in the process, and they get harder and thicker than you'd think. Last step: Attach a string, ribbon, cord, metal ring, whatever you have on hand and voila, pet gift tag, pet lover gift tag, pet ID tag and what have you, puppers. Overall, we LOVE the shrinky dink concept. As mentioned earlier, the little details such as how fine you cut your pieces out do show. We've got a few more sheets and a few more ideas, so we're gonna practice a bit and we'll be back again soon to show you what else we come up with! Hello, my old friend, NO NO FRIDAY. Mom and I had actually talked about having to change NO NO FRIDAY to FRIDAY FINDS because I have been on such good behavior lately. We all knew it would eventually. I messed with the product again. Or, rather, the process this time. Mom was taking product photos. The light was just right. The set up was perfect. So perfect, in fact, that I hunkered myself on down into that rug she was photographing. 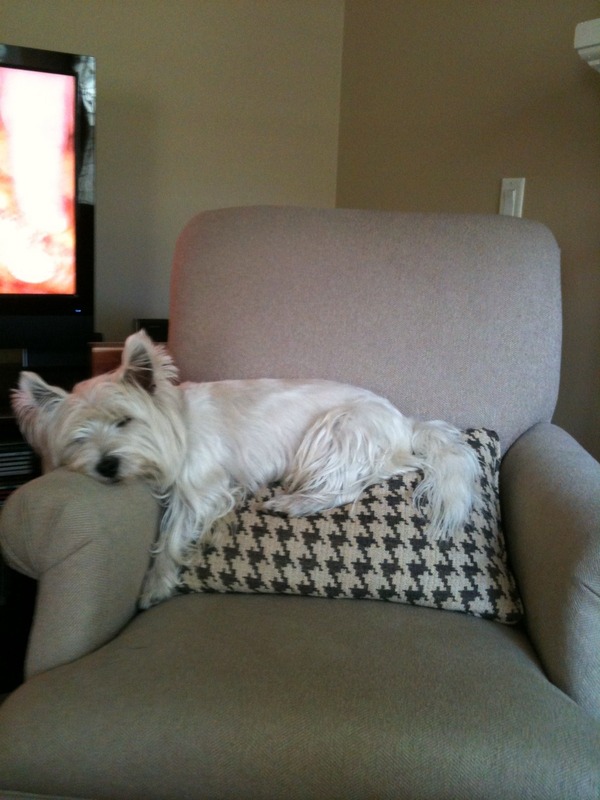 Yessiree, made myself downright comfortable, I did. Not to worry shoppers, we've declared that particular rug mine ... yours will come un-snuggled in, should you choose to purchase one. Carry on into the weekend puppers. Carry on! Puppy Tweets: Is it for you? It's here, it's here ... Twitter for Dogs! 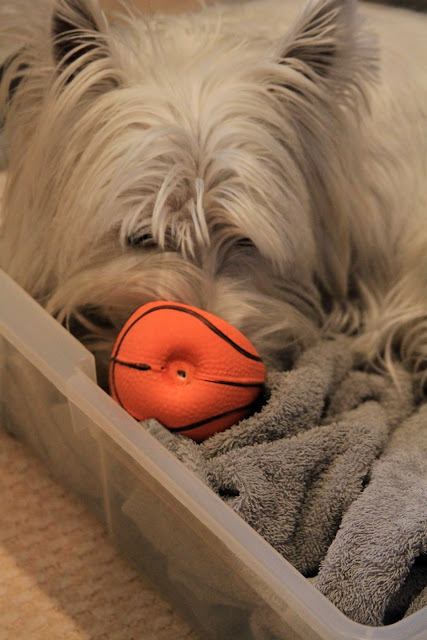 And we quote "Ever wonder what your dog is doing while you're away? Whenever your dog moves or barks, The Puppy Tweets tag detects it and sends a Tweet via Twitter. You can follow your dog's Twitter feed on your computer or smart phone all day. 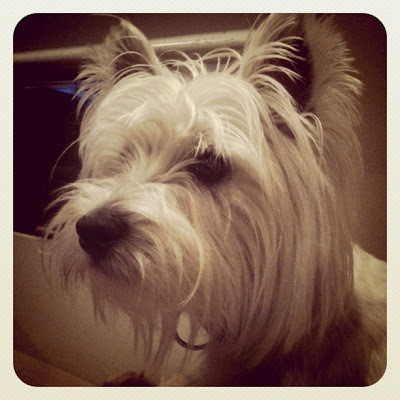 Puppy Tweets is a great way to brighten any pet owner's day." We may have to put this one on our wish list. You can check it out for yourselves here. 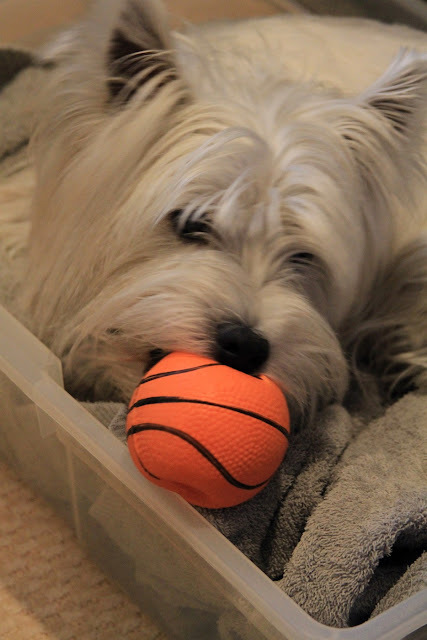 @ mom: I am in my tub playing with my ball. 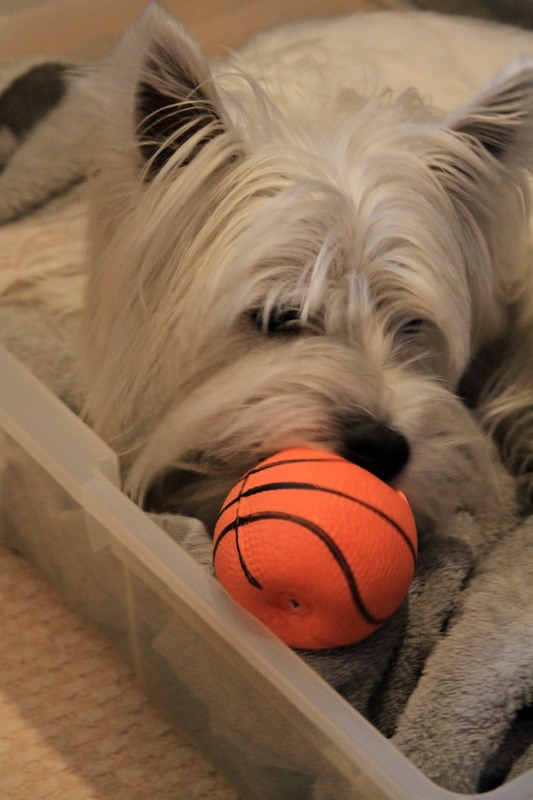 @mom: I am in my tub playing with my ball. I think we're all starting to get a pretty clear picture of an average day around here. Anybody gonna try it??? Let us know! First up, on a personal note, we'd like to have that baby up there for ourselves. I mean, put your paws together for a human pup as cute as me! 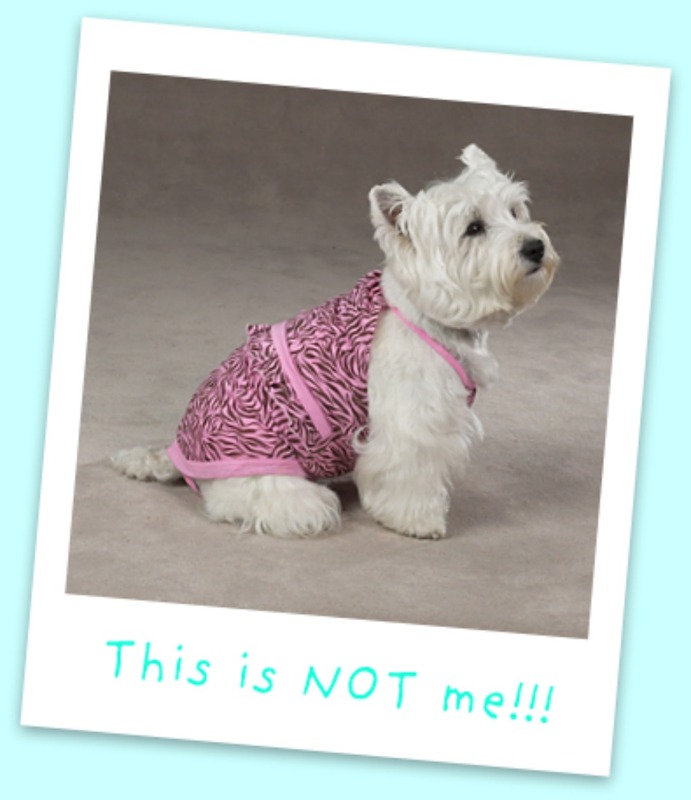 And, CHECK OUT THAT WESTIE OUTFIT. Great taste for such a wee one. And, if that is not enough for you, the shop owner is from TEXAS and I know alot of you puppers out there are hanging out in the Lone Star State. Shop local, puppers! You can find the outfit here, at Oliver Blu Designs, and if you must, you can get a dog design other than a Westie. But, really, why go there??? PS, if I were in Texas, I'd call that photographer too. Mom says that over time you develop a reputation for giving certain gifts ... people sometimes develop a "go to" gift if you will. In our case, that would be anything made by Chloe Jane Handmade. 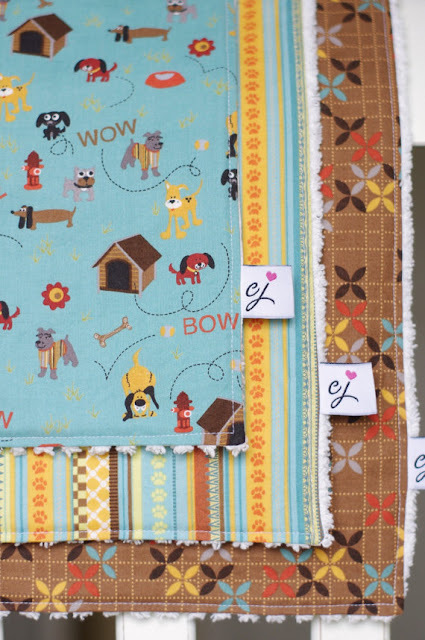 We had the opportunity to meet Emily, the seamstress extraordinaire, in San Francisco not too long ago and we have been buying burp cloths for our baby gifting needs ever since. Imagine our delight when we saw that she now has "Puperie-Appropriate" burp cloths!!!! SPOILER ALERT: some of you have burp cloths going to the post office today, in fact :) You can find burp cloths, blankets, stroller covers and much more right here. Shop on, puppers, shop on! 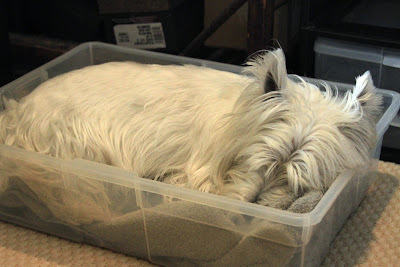 Interesting Dog Beds: the "tub"
You may recall from this NO NO FRIDAY post that we have been having issues around here with me using the tablecloth tub as my go-to spot in Mom's office. 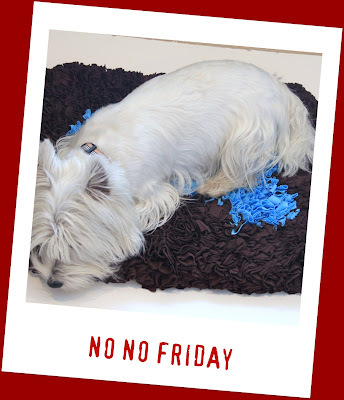 As you will recall, I dared to say that MOM was the NO NO FRIDAY recipient and was so bold as to say that if she was dumb enough to leave the tablecloths in a tub on the floor, I was gonna crawl on top of them. It was a daring approach to take, me putting the blame on my mama and all. My review? I look GREAT, thanks for asking. OK, seriously, I love this one. It is a comfy bundle of yum to hang out on. That being said, it's made up of little pieces that kind of tempted me to chew on them. Just trying to be honest because we carry them in our store (find them here) and we like to call a bone a bone. We're going to put the towels back in the tub and suggest you use this one for a bath or kitchen mat, as most people who have bought it from us have said they're going to do. So this weekend my mom took The Puperie on the road again to a dog wash at the Costa Mesa Bark Park. You may recall that I am no longer allowed to attend events because I am so cute I keep people from shopping bark so loud that I scare customers off. This time, I was OK with not going, because it appears I'd have ended up getting a bath, and we all know that's not my favorite way to spend a Saturday! I seriously think this dude was just happy they apparently were not going to go near his face! This one was thinking "Hey, look at everybody taking my picture. I knew I was the cutest dog here!" This one was surely thinking "Woo hooo, puppers, I got the cheerleaders washing me! " Mom said this one was giving her mama "the look" the entire time! Anybody who does not know what soap tastes like has never washed a dog. Whoa, puppers. That is NOT ME up there. I know what you're thinking ... that mom has finally gone over the edge with the dressing me for the sake of the blog. Nope, not the case. 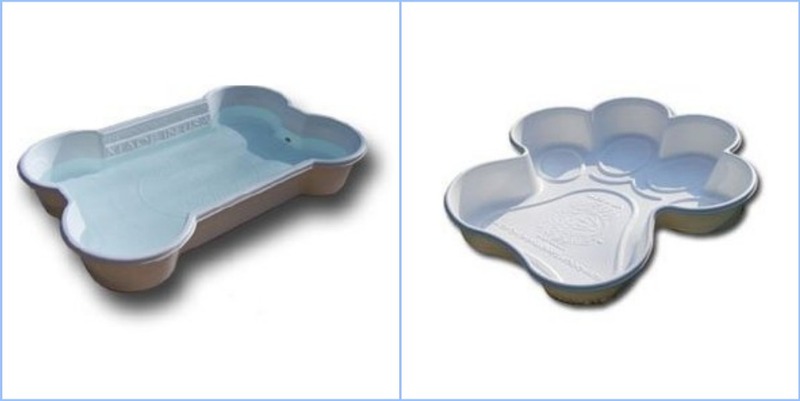 That top one is just a picture from a site we found when we were looking for dog swimsuits. We were doing a little search since we seem to have a "dogs in summerime" theme going here this week and it turns out there's lots more suits for you girly types than for us dudes. 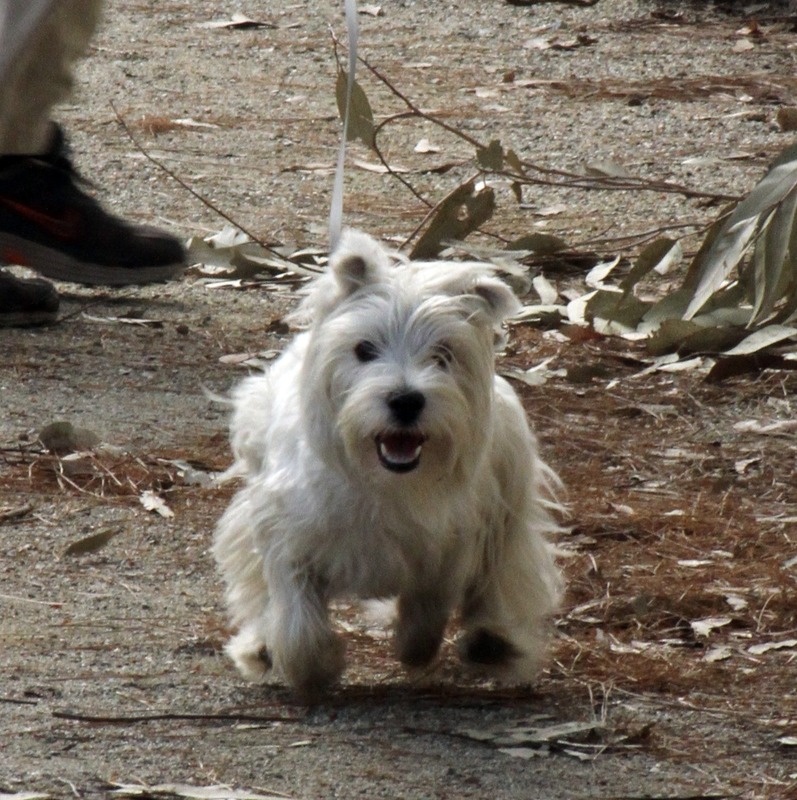 Plus, of course, we needed to showcase a westie strutting her stuff while we had the chance. Anywoof, not to worry because I am going to keep searching and find me some Hawaiian swim trunks or something real quick before mom decides to put me in a speedo or something. Whoa, THAT vision gives me a headache grande. Since I haven't found a suit, I decided to jump start my hip summer look by wearing shades. We did not do any actual research on eye protection for pups but my mom has always said I should have them when I cruise around with my dad if we have the the top down. (Really? IF we have the top down? What would be the point of cruising otherwise??) Far and away the most popular brand we found was Doggles. If you click the link under the photo up there, you can buy some for yourself should you be inclined to be as cool as I think I am me. 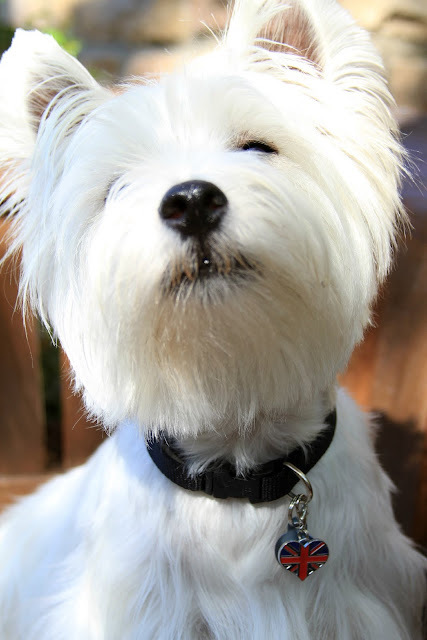 Now, what we have done some research on, me being a fair skinned white pup and all, is sunscreen. One thing we know for sure is that zinc oxide is a NO NO for puppers. Don't cover us in that stuff. Also, did you know that us short leggeders get a double whammy ... our bellies can get burned from the reflection on the pavement. Go figure .. never considered that one before. 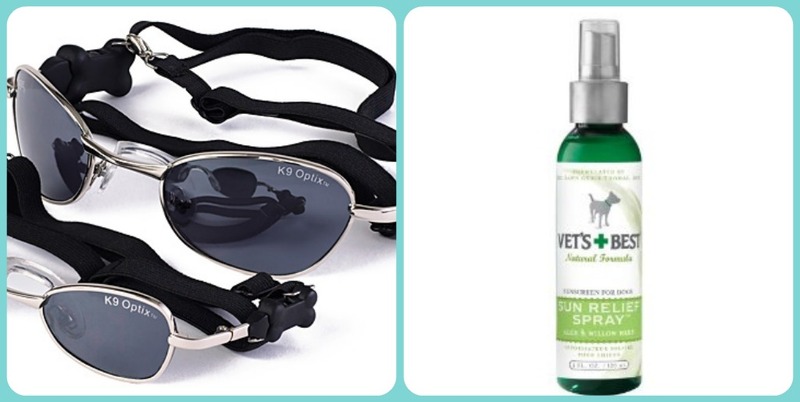 You can hit the link up there to go to one of the sunscreens we found for pups. We read some websites that said baby and sensitive skin sunscreens are OK for pups and that you don't need to spend the extra money on pup stuff. Check with your vet though, because like I said, we know for sure that zinc oxide is a NO NO, and you know we're gonna be licking all over the places you put the stuff. Summer safety is what it's all about puppers! You may recall from earlier posts that I am quite the avid swimmer. We have not talked about it much lately being that I did not, actually, make the 2012 Summer Olympic team. It was, indeed, a great disappointment for all of us here, but I just did not have the right equipment for training. So, once again, we've googled it. And, do you know what???? There is actually a website called www.dogpools.com. Yes, really. Click the link and you'll see, oh non-believers. Yes, really. These are pools and not baking pans! You can check them out here and here if you don't believe me. And, since you're already gonna be there, I'd like the bone one, but I think the paw shaped one would fit better in my patio training center. P.S. Mom said please, no pools! Listen up pups and pup-people. There's a couple of iphone apps I just know you're gonna wanna know about! With this one, you pick a toy and slap the phone with your paw and your mom's phone squeaks like the toy. It's amazingly fun. Why my mom downloaded this one, I'll never know. Play up when you can pups, because this one is probably not one that is going to stay on the phone for long! Plus, you have to pay a little something to get this one. This one tells you what to do in pupper emergencies. We checked out what to do if I start choking ... you know me and my love of food! I think this one cost us $1.99. dog park finder: This one is free and found LOTS of dog parks near our house, some of which we did not know about. instagram: this is a photo app we use alot ... you can pick different vintage looking effects, like the one on the photo above. picture effect magic: this one is another photo app we use ... you can get some "sketch" effects with this one, like the photo below. With this one we are realizing that either (1) we need more practice or (2) it works best for uploading to websites like facebook. The resolution is kind of low here. Plus we're pretty sure it's gonna work the best if you start with a picture with not much background to it. There's tons and tons of apps out there ... from virtual pet ownership to the Westie Rescue of CA where you can see the puppers available for adoption. Go ahead, play around with it! 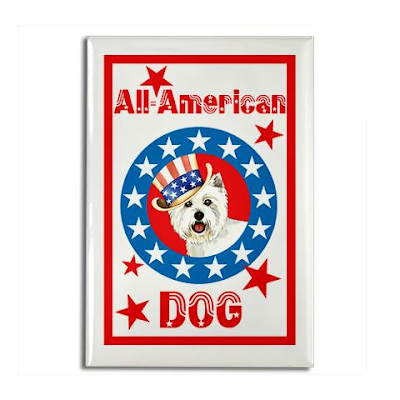 Happy 4th of July, woofers!!!! I know you're shocked that there is not a picture up there of me in an Uncle Sam hat or something. Actually, me too. Maybe mom has decided to lay off the props? We googled "Westie 4th of July" and ended up learning about lots of dog parades this weekend all over the country. Maybe we'll host one next year. After getting really bummed about there not being a parade in our 'hood, we ended up on the Cafe Press website. 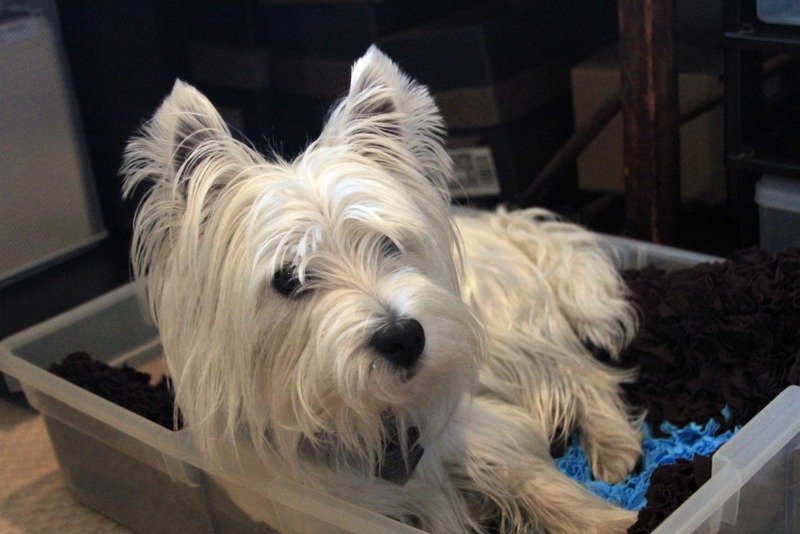 They have some really, really cool stuff that comes up if you just search for Westie. Not that we wouldn't rather you got your stuff from The Puperie, but we'd understand if you need something we don't have. And, no, Cafe Press does not need our help with advertising ... we got nothing for the mention, we just like their Westie stuff. Be safe and enjoy puppers!